You’ve probably heard a lot about food and drink fads, both past and present—from cupcakes to kale to bacon-infused cocktails. But Americans are also looking for creative ways to consume their favorite concoctions, which is why the food and beverage industry is serving us more events than ever before. In 2014 alone, the number of food and drink events on the Eventbrite platform increased by 47% compared to the previous year. Foodies are craving a different kind of dining experience. 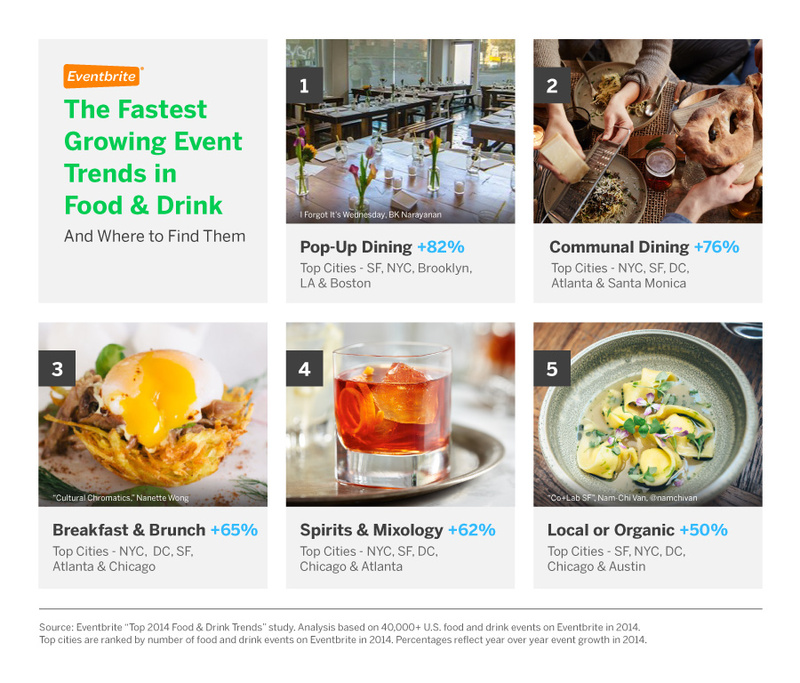 One-time food and drink events—typically highlighting a particular chef, unique menu, or unexpected theme—are leading growth. Not only do pop-up events allow guests to get up close and personal with the people who made their meal, but they also allow chefs to really show off their creative culinary chops. Check out this video series documenting how Top Chef finalist Melissa King made her dreams of a collaborative pop-up dinner featuring local makers an awe-inspiring reality. From communal seating to family-style shared plates, more and more events are embracing the power of food to bring people together. Supper clubs like “I Forgot It’s Wednesday” (IFIW) offer a social dining experience, catering to food lovers who crave a connection to their meal—and to their fellow diners. IFIW, recently named Top Supper Club in San Francisco by 7×7, is built on the principle that your dining experience is enhanced when you’re made “comfortably uncomfortable” by rubbing elbows with strangers. In fact, our food and drink study shows that guests are heading to special dining events like these more than ever to make new friends around a shared experience. Want in on the club? You’re in luck! There is an IFIW pop-up coming to San Francisco on April 25th. Get your tickets here. Spirits and mixology events outpaced beer, wine, and food-related events last year. Whiskey was the liquor of choice in 2014, representing a 96% increase in event growth over the course of the year—and accounting for 20% of all spirits events. New York City poured up the most whiskey events by far. The five boroughs played host to more than double the number of whiskey events in the runner-up city, San Francisco. If you’re in NYC and want a taste of the good stuff, take a look at some of the city’s upcoming whiskey events here. 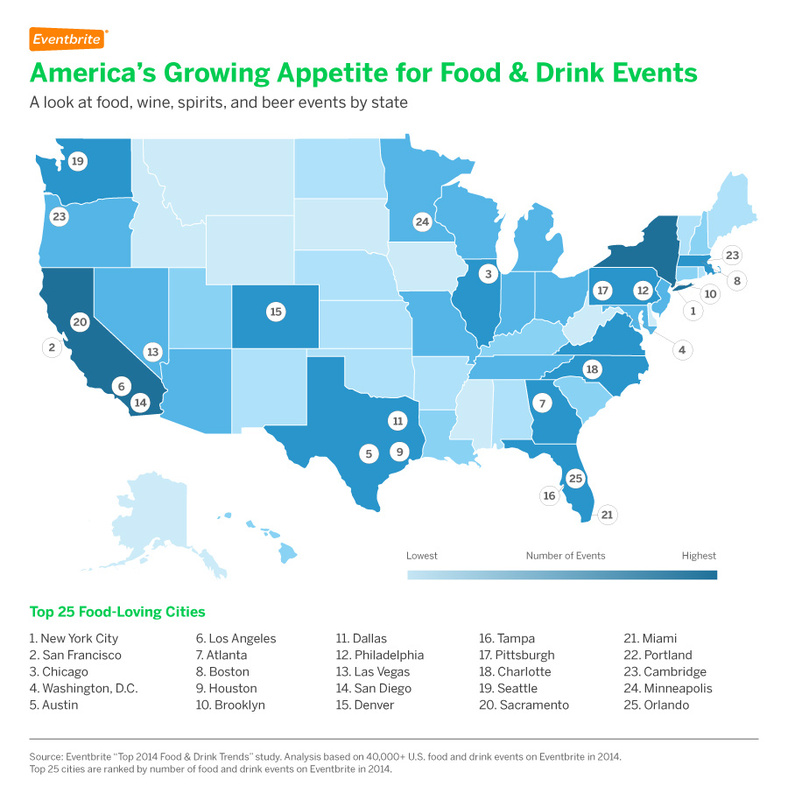 Here’s some food for thought: From farm-to-table to craft beer events, 1 in 4 food and drink events hosted on Eventbrite in 2014 specifically focused on local or organic ingredients. The most popular in this category is spirits, with a 76% event growth rate. While organic foods have been a focus in the foodie world for quite some time, now attention is turning to small batch and local distilleries. After all, you are what you drink. 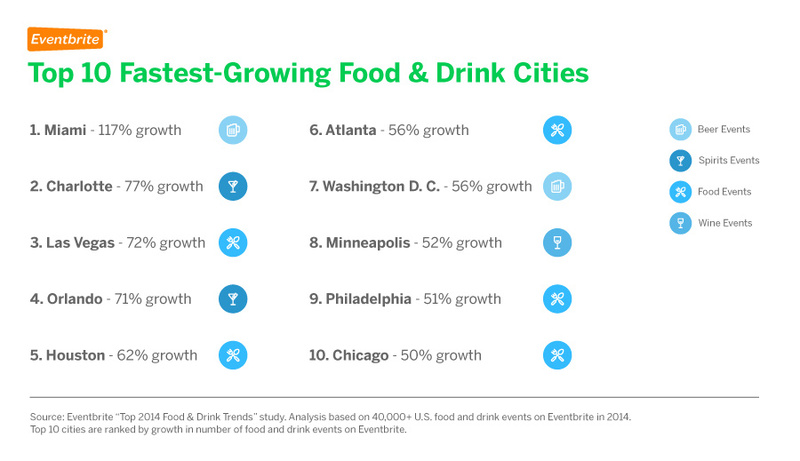 Check out events in your area, and be next year’s food and drink trendsetter. Inspired to create your own event? Head on over to www.eventbrite.com/food to learn more.